Here's an easy solution to the "What's for dinner?" dilemma. 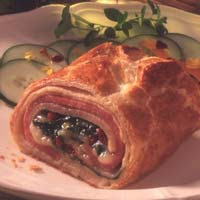 Try serving ham, turkey, cheese and spinach all wrapped up in flaky puff pastry. It's delicious! Heat the oven to 400 degrees F. Beat the egg and water in a small bowl with a fork. Stir the onions, pimientos, if desired, and oregano in a small bowl. Unfold the pastry sheet on a lightly floured surface. Roll the pastry sheet into a 16x12-inch rectangle. With the short side facing you, layer the ham, turkey, spinach and cheese on the bottom half of the pastry to within 1 inch of the edge. Sprinkle with the onion mixture. Starting at the short side, roll up like a jelly roll. Place seam-side down onto a baking sheet. Tuck the ends under to seal. Brush the pastry with the egg mixture. This entry was posted on 9:31 PM and is filed under Turkey . You can follow any responses to this entry through the RSS 2.0 feed. You can leave a response, or trackback from your own site.